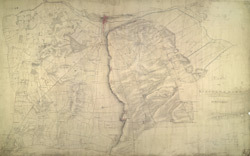 This drawing shows the county boundary of Lincolnshire and Nottinghamshire as a red dotted line down the left of the sheet. The county town is depicted at the top of the plan on the north bank of the river Witham, set on the summit of the limestone ridge known as the Cliff Hills. Water-filled dykes, constructed to drain the fens, are represented to the right of the sheet, together with the ancient cattle droves, long straight roads that characterise this part of the Lincolnshire landscape.